It was another disappointing round for Russia's speed skaters on the second day of the Sprint World Cup in Moscow. Despite high expectations, not one of the five Russians on show got near the podium. With Russia's speed skaters having an off day on Saturday, they all knew they would have to perform very well on the second day to have any chance of sealing a winning place. Russia's best chance of winning a medal was in the women's 500 metres sprint, where Yulia Nemaya started the day in 5th. Still, the Russian wasn't able to make up enough time, and eventually had to settle for 6th place overall. The women didn't fare any better in the 1000 metres. 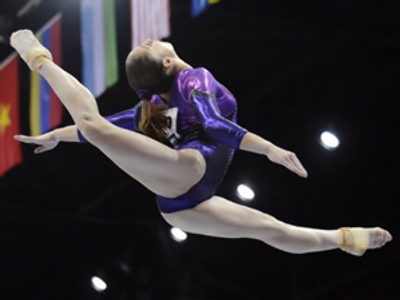 The only Russian to appear in the top 15 was Ekaterina Malysheva, while Ekaterina Lobysheva had a championship worth forgetting, as she finished as low down as 19th in the overall standings. The competition has not seen a great performance from Russia's women, while the overall title went to China's Beixing Wang, who just pipped Germany's Jenny Wolf. Former Torino silver medalist Dmitry Dorofeev says the Russian women are in a period of transition. Day two was more productive for the men, with Evgeny Lalenkov producing by far the best performance by a Russian at these championships. After a poor opening day, Lalenkov, who won the European 500 metres title just a week ago in Herenveen, was able to come home third in the 1000 metres – though he would finish the championships in only 16th place.